How much risk do you live with? The world is full of dangers -- from serial killers to cancer. But why do we worry about the things we do? Imagine for a moment that you're skydiving. As your tiny plane reaches 12,000 feet, you jump out the side window and begin your fall to Earth. Within 15 seconds, you are slicing through the air at terminal velocity. Over the next 30 seconds, as the wind rushes through your hair, the ground slowly -- and then more quickly -- begins to draw near. Buildings that were mere dots just moments ago now appear larger and more distinct. You look at the altimeter on your wrist: 5,000 feet. 4,500 feet. 4,000 feet. You pull the ripcord. Nothing. You pull the cord again, this time as hard as you can. Panicked and distracted, you fiddle with your gear, trying to make sure that nothing is caught or knotted up. Finally, you decide to deploy your reserve parachute. You hit the ground at 195 kilometres per hour. Until recently, about a dozen people a year in the U.S. lost their lives in just that terrifying scenario -- in so-called "no pull" or "low pull" skydiving fatalities. While all skydivers have a reserve chute, the failure of the main chute to open was so distracting for some jumpers that they forgot to pull their reserve in time. Then, in the early 1990s, a German company came out with the Cybernetic Parachute Release System (Cypres) -- a tiny electronic device that monitors altitude and velocity and automatically deploys jumpers' reserve chutes if they forget. Over the next few years, the system was widely adopted and, as one would expect, no-pull and low-pull skydiving fatalities plummeted -- from 14 in 1991 to zero in 1998. During that same period, the total number of skydiving fatalities in the U.S. actually increased -- from 30 in 1991 to 46 in 1998. The reason: The dramatic drop in no-pull deaths was offset by an even bigger jump in landing fatalities, many of them due to skydivers performing thrilling, and dangerous, "hook turns" as they came in to land. "There was a behavioural change on the part of skydivers," said Vic Napier, a skydiver who studied the phenomenon while a graduate student at Western Oregon University. "As soon as we made skydiving safer in one area, skydivers found a way to make it more dangerous in another." Napier's study is one of the more startling examples of a theory known as risk homeostasis. The idea is that, as safety features make activities less dangerous, we become more willing to take risks -- in effect, making the activity as hazardous as it was before. There's no question that skydivers -- adrenalin junkies who voluntarily jump out of planes -- probably aren't the best example of how average people behave. But it's more relevant than you might think. Imagine it's Monday morning and you're getting ready for your daily commute. You jump into your car, surrounded by a century of advancements in automobile safety: seatbelts, airbags, anti-lock brakes. As you pull out of your driveway, you feel safe and secure. And a growing body of research -- which we'll get to in a moment -- suggests that as you make your way to work, you'll behave a lot more like those skydivers than you'd care to admit. It's safe to say that, if it weren't for fear, the human species would have died off long ago. The fact that our ancestors knew when to run away from the sabre-toothed tiger -- and, alternatively, when it was safe to run after it -- is why we're here today. But evaluating the risk of an ancient predator is a very different skill than figuring out how much you should worry about industrial chemicals or violent crime. As a result, experts say, our response to risk is often downright bizarre. We worry about E. coli on our spinach or mad-cow disease in our beef while ignoring the monumental, and proven, impact that exercise and diet can have on our health. We warn our kids not to talk to strangers even though 90 per cent of sexual abuse is committed by someone a child knows. And we freak out about plane crashes despite the fact driving is about 65 times more dangerous. And those who study risk perception say there are a few reasons why. Regardless of how risky a behaviour may be, we are less fearful of it when we are in control than when we're not. That's why many people would rather drive themselves somewhere than take a flight -- even though, no matter how good a driver you are, flying is almost certainly safer. It also may explain one of the more bizarre findings in risk research: the "white male effect." When researchers ask people to rank how afraid they are of different dangers -- say, child abductors, earthquakes and house fires -- people of different backgrounds generally rank them in the same order. "But if you ask them how afraid they are of each one, white men ... are about 10 per cent less afraid than white women or people of colour," said David Ropeik, an independent risk consultant formerly with the Harvard School of Public Health. No one knows for sure why they are less fearful. But Ropeik said one theory is that white men -- who are over-represented in politics and business -- feel like they have more control over things than women and visible minorities do. Another big factor in risk perception is whether something is voluntary. Skydiving, downhill skiing and rock climbing are all pretty dangerous sports. But participants have voluntarily decided to accept those risks for the thrill the sport gives them. In contrast, people seem to have a very low tolerance for risks that are imposed upon them -- and for which they get no immediate benefit. There is little proof that nuclear power stations, cellphone towers or hydro lines are dangerous. But those who live next to all three would understandably prefer if someone else took that tiny risk instead of them. "It's one thing to use a phone and wonder whether it might be giving you brain cancer," said Sandman. "It's another thing to have a [cellphone] tower put up across the street from your apartment. "You're not getting anything out of that tower and every time you look out the window, there it is glaring at you." Ropeik said it's interesting that people get worked up about nuclear power -- which has caused no known deaths in North America -- yet many still don't use sunscreen. "Man-made radiation is scary -- but less likely to give you cancer," Ropeik said. "Natural radiation is less scary but it kills 7,000 Americans [and 750 Canadians] a year from skin cancer." The most difficult type of risks for people to assess properly, experts say, are what are known as "low-probability, high-magnitude-risks." Simply put, they are those things that are both very, very rare and very, very awful -- like child abductions and serial killings. "[These] risks are very hard to think about and very hard to talk about," Sandman said. "People will either focus on the horrible and forget the unlikely or they'll focus on the unlikely and forget the horrible." So while some people dismiss such risks as so rare as to be trivial, others fret about them intensely and go to great lengths to avoid them. But does it matter if our perception of risk is sometimes off base? Experts say yes -- if for no other reason than it results in individuals, and governments, spending time and money avoiding the wrong things. "You can't get rid of a risk," said Robin Gregory, a risk expert based on Galiano Island. "But you can almost always, if you're willing to spend more money, get more safety." But the cost of more safety varies from risk to risk. In the mid-1990s, a U.S. team of researchers attempted to calculate the cost of saving a single life by using more than 500 different government regulations and safety measures. Some safety measures were very cost-effective. Requiring furniture-makers to use flame-retardant material cost only $300 per life saved while mandatory seatbelt laws were a bargain at $69. Other measures were far more costly -- such as putting smoke detectors in airplane washrooms ($30,000 per life saved). If we had a better sense of risk, experts say, we could spend money more wisely. "As a society, by passing all sorts of laws and devoting lots of money to very low probability dangers ... we're spending money and energy and human capital that we could be spending on the bigger dangers," said Barry Glassner, a sociology professor and risk expert at the University of Southern California. A good example, he said, is measures to protect children. "Instead of protecting children from some very unlikely abduction or molestation at school, if we put [the money] into the physical structure of the school or hiring additional teachers or having better equipment, we would be doing them a great service," he said. Another major problem with fear is that it can sometimes backfire. Studies on the children of breast-cancer sufferers have found that those who are most afraid of getting cancer are also the least likely to examine themselves for lumps. "If you ask yourself why women don't do breast examinations, there are some women who don't because they're not worried," said Sandman. "But there are a lot of women who are so worried about breast cancer they can't bear to look." Other times, people -- as the saying goes -- jump out of the frying pan and into the fire. Following the Sept. 11 terrorist attacks, many people were terrified to fly and decided to drive instead. As a result, in the year after the attacks, interstate highway traffic in the U.S. jumped significantly and -- as one might expect -- led to a greater number of fatal highway crashes. A recent study of those figures estimated that the urge to avoid flying for that one year resulted in the unnecessary deaths of 1,500 Americans -- more than five times the number who died on the four planes involved in the Sept. 11 attacks. The human response to risk is hard-wired -- meaning there's little hope of getting people to stop worrying about the things they fear. But researchers say governments -- and individuals -- should make some effort to focus time and money on significant risks that often get ignored. "Carve out a corner for worrying about things that aren't upsetting and are dangerous -- that you know you're inclined to pay too little attention to," said Sandman. "Make your kids wear a bicycle helmet and wear a seatbelt. Worry more about obesity than you do and be more alert to the fact that you're not getting all the vaccinations that your doctor says you ought to." Of course, it's not always easy to figure out how risky something is. For example: What should you be more afraid of dying from -- cancer or heart disease? On the surface, the answer to this one is easy: heart disease. According to 2003 data, 10 per cent more people die of heart disease than cancer in Canada. But those who die of cancer are, on average, eight years younger -- 71 compared to 79. Assuming an optimum life expectancy of 90, that means cancer takes away roughly 50 per cent more years from people's lives than heart disease does. And more than half of those who die from heart disease are over 80 -- well above the average age at death of 74. There are, of course, people who tragically drop dead of a heart attack at the age of 40 or 50. But statistics suggest that, for the most part, heart disease is something you die of when you're lucky enough to avoid being killed by everything else. The other big unknown in calculating risk is contributing factors. Mortality statistics suggest you have a one in 12 chance of dying of lung cancer. But of course that's nonsense. About 85 per cent of lung cancer cases are believed to be due to smoking. So if you're a non-smoker, your chance of dying of lung cancer is less than one in 100. Similarly, crime statistics suggest your chance of being murdered this year in Vancouver is about one in 35,000 -- which is pretty low to begin with. But more than 80 per cent of murders in B.C. are committed by someone the victim knows. How many people do you know who might want to kill you? If you're a Hells Angel or a gangster, that could be a pretty long list. If you're a suburban soccer mom, not so much. Now back to your daily commute. Cars today are dramatically safer than they were a few decades ago -- with crumple zones, airbags and anti-lock brakes. And yet, while traffic fatalities have declined, they haven't dropped nearly as much as you'd expect given such major advances in vehicle safety. Gerald Wilde, a retired professor at Queen's University in Kingston, Ont., and one of the leading experts on risk homeostasis, said there's a simple reason for that. In any activity, Wilde said, we have a "target risk" that we are willing to accept -- a balance between risk and performance. Safety features give us the option of getting the same level of performance with less risk to life and limb. But in most cases, Wilde said, people instead take the extra performance. Controlled studies have consistently shown that when people get a new safety feature -- whether it's anti-lock brakes or driver-side airbags -- they drive faster, more aggressively and more often. And it's not just driving. Smokers take longer, and deeper, puffs on low-tar cigarettes. And as flood-control measures improve, people build their homes in increasingly flood-prone areas. 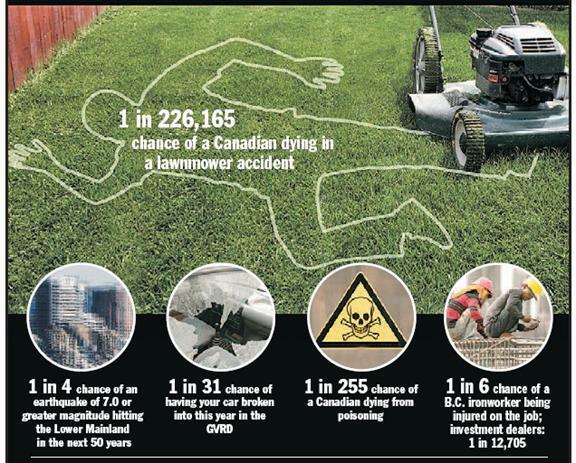 The solution, Wilde said, is to design safety programs that are focused on human behaviour instead of product safety. For example, he said, automobile insurance programs that give discounts for being accident-free have been remarkably effective in reducing car crashes. And manufacturing plants that reward employees for low rates of workplace injury have had more success in improving safety than those that make a lot of new rules, he said. The key, Wilde said, is understanding that risk is not something humans avoid -- it's something we manage. "Risk in life is like the salt in your soup," he said. "You don't want too much nor too little." Based on Greater Vancouver crime statistics and population figures for 2005, what follows is an estimate of your likelihood of falling victim to the following crimes over the next year and next 15 years. NOTE: Risk of murder is based on BC Stats estimate of Greater Vancouver's total population (2,131,340). Risk of vehicle crimes are based on Insurance Corp. of B.C. figures on the number of registered vehicles in Greater Vancouver (1,346,7050). Risk of break-ins is based on the total number of private residential dwellings in Greater Vancouver (786,277). * This is based on the percentage of all solved homicides in B.C. that are committed by someone who is a stranger to the victim (18.3 per cent). HOW LIKELY IS A MAJOR NATURAL DISASTER? Ran with fact boxes "Risk Of Being A Victim of Crime" "Risksto Mothers and Their Babies"and "How Likely Is A Major NaturalDisaster? ", which have been appended to the end of the story.